Virginia is a state in the South Atlantic region of the United States. Virginia is nicknamed the "Old Dominion" and the "Mother of Presidents" after the eight U.S. presidents born there. Virginia has a total area of 110,784.7 km2, including 8,236.5 km2 of water, making it the 35th-largest state by area. Virginia is bordered by Maryland and Washington, D.C. to the north and east; by the Atlantic Ocean to the east; by North Carolina and Tennessee to the south; by Kentucky to the west; and by West Virginia to the north and west. Virginia's boundary with Maryland and Washington, D.C. extends to the low-water mark of the south shore of the Potomac River. Northern Virginia - the populous area bordering Washington, D.C., is influenced by the city's culture. Eastern Virginia - includes such tourist hot-spots as Colonial Williamsburg and Virginia Beach. Central Virginia - home to Richmond, Virginia's capital city, and features historic sites from the Revolutionary and Civil Wars. Southwest Virginia - also known as Virginia's highlands, is a mainly rural region defined by its Appalachian heritage. Shenandoah Valley - bordered by the Blue Ridge Mountains, a region to enjoy nature at Shenandoah National Park. Virginia Beach is the state's largest city. One fork of Shenandoah River. Shenandoah National Park encompasses part of the Blue Ridge Mountains in the U.S. state of Virginia. The Park headquarters are located in Luray. 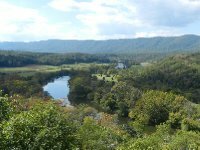 This national park is long and narrow, with the broad Shenandoah River and Valley on the west side, and the rolling hills of the Virginia Piedmont on the east. Although the scenic Skyline Drive is likely the most prominent feature of the Park, almost 40% of the land area has been designated as wilderness and is protected as part of the National Wilderness Preservation System. The highest peak is Hawksbill Mountain at 1,235 metres. The park is best known for Skyline Drive, that runs the entire length of the park along the ridge of the mountains. The drive is particularly popular in the fall when the leaves are changing colors. Over 160 kilometres of the Appalachian Trail are also in the park. In total, there are over 800 kilometres of trails within the park. Of the trails, one of the most popular is Old Rag Mountain, which offers a thrilling rock scramble and some of the most breathtaking views in Virginia. There is also horseback riding, camping, bicycling, and many waterfalls. The Skyline Drive is the first National Park Service road east of the Mississippi River listed as a National Historic Landmark on the National Register of Historic Places. It is also designated as a National Scenic Byway. The climate of Virginia becomes increasingly warmer and more humid farther south and east. Seasonal extremes vary from average lows of -3 °C in January to average highs of 30 °C in July. The Atlantic Ocean has a strong effect on eastern and southeastern coastal areas of the state. Influenced by the Gulf Stream, coastal weather is subject to hurricanes, most pronouncedly near the mouth of Chesapeake Bay. Washington Dulles International Airport and Ronald Reagan Washington National Airport handle air traffic for much of Northern Virgina, while other major airports include those at Norfolk and Richmond. Richmond International Airport (RIC) has flights to/from Toronto, Orlando, Dallas, Atlanta, Chicago, Miami, Freeport, Cincinnati, New York, Minneapolis, Detroit, Boston, Fort Lauderdale, Cleveland, Houston, Washington, D.C., Charlotte and Philadelphia. Norfolk International Airport (ORF) offers flights to/from Chicago, Washington, D.C., Houston, Charlotte, Dallas, Miami, New York City, Atlanta, Boston, Detroit, Minneapolis, Baltimore, Jacksonville, Nashville, Orlando, Tampa, Las Vegas and Philadelphia. Newport News and Roanoke have airports with some useful flights as well. The Cardinal/Hoosier State between New York and Chicago. The Carolinian/Piedmont between New York and Charlotte, North Carolina. The Crescent between New York and New Orleans. The Northeast Regional between Boston and Newport News, Virginia. The Silver Service/Palmetto between New York and Tampa/Miami. The Autotrain between Lorton, Virginia and Orlando, Florida. Interstate 81 is the main route from Tennessee and continues through Virginia into Maryland and Pennsylvania. Interstate 66 connects Northwestern and Northern Virginia with Washington, DC. Interstate 95 runs north-south through Virginia connecting Washington, DC to Fredericksburg and Richmond, on to North Carolina. Interstate 495 encircles Washington, DC with part of its route going through Northern Virginia. Where I-95 intersects with I-495 at the southernmost end of I-495, Interstate 395 continues northward into DC while I-95 traces the same route as the eastern half of I-495. Thus, if you are to take I-95 from Richmond to Baltimore, MD, you would merge onto I-495 going East and North until I-95 splits off from I-495 on its north side to reach Baltimore. Interstate 64 runs east-west through Virginia, connecting the Hampton Roads area with Richmond and Charlottesville. West of Charlottesville, it joins I-81 at Staunton. The two highways split at Lexington, with I-64 going through the western mountains until entering West Virginia. US 29 connects the Western Washington Suburbs to North Carolina and Atlanta forming a scenic alternate route to taking I-95 to I-85. A four lane divided highway throughout the state, it offers a short route to the Southeast avoiding heavy freeway traffic. US 301 enters the state from North Carolina with I-95 and is a popular short route north of Richmond to Chesapeake and Northeast destinations bypassing the Baltimore-Washington traffic. Check Greyhound buses for options. Amtrak trains run from Norfolk/Newport News to Richmond and out to the western panhandle. Trains also run north and south between Richmond and the Northern Virginia/DC area. A third major line runs from the western panhandle, north through Charlottesville, and up to Northern Virginia. Virginia Railway Express (VRE), a commuter rail line, serves Washington, DC from points as far away as Fredericksburg and Manassas. The Washington Metro has several rail stations in Arlington, Alexandria, and Fairfax County. Many international rental companies have a wide selection of rental cars and these include Hertz, Avis, Dollar, Thrifty, Enterprise, Budget and Alamo/National. Most companies will require you are at least 25 years of age, although younger people might be able to rent cars at slightly higher rates and with some insurance differences as well. A national driver's license is usually enough, but an additional international one is recommended. Also note that it usually costs more to include lots of other extra things. For example extra drivers, GPS, the first full tank, SLI (Supplemental Liability Insurance), PAI (Personal Accident Insurance, usually covered already at home), road assistance/service plan, and drop-off costs for one-way rentals. If you want to book a car, it is recommended that you book your car before arriving in the USA. This is almost always (much) cheaper compared to just showing up. Also, try and book with a so-called 'broker', which usually works together with a few or many car rental companies and can offer the best deal. Some examples include Holidayautos, Holidaycars and Sunny Cars. Some of the cheapest deals to book from Europe, includes Drive-USA, which also has a German version. For more information and tips about renting cars and campers, additional costs, insurance, traffic rules, scenic routes and getting maps and fuel it is advised to check the USA Getting Around section. Virginia has a number of National Scenic Byways which offer a great way to explore the state crossing beautiful landscapes. Mostly, there are lots of national parks, state parks or monuments along the way and it's generally a better alternative than the faster but boring Interstate Highways. The Virginia Department of Agriculture lists producers on its Virginia Grown website, and there are dozens of seasonal food and drink festivals across the state. Quality processed foods made in Virginia are promoted through the Virginia's Finest program. Most of the signature dishes of the state are common to Southern/American cuisine. Country ham is a cured specialty frequently served at holiday meals and breakfast with the largest producers based around Surry county. In the Southeast is the county of Brunswick, one of several locations that claims itself to be the birthplace of Brunswick Stew. The Highland County Maple Festival celebrates local maple syrup producers high up in the Blue Ridge mountains, the lines for the Ruritan's pancake breakfast's are super long, though with a friendly atmosphere, and can be avoided by dining in an area restaurant/inn. Do try the maple doughnuts made with nutmeg and fresh maple syrup. The Chesapeake Bay region produces some of the nation's best seafood, especially crab and oysters. Tap water is safe to drink. Virginia law requires you to be 21 to buy alcohol or consume alcohol. Photo ID will be required to prove age. Beer and other alcoholic drinks are available from most restaurants and bars, with purchase prohibited between 2 and 6AM. Variety of what is available differs from restaurant to restaurant and when in doubt people should check menu or with a waiter to see what is available. Beer, wine, and malternatives/alcopops are sold at most grocery and convenience stores, but cannot be purchased between midnight and 6AM. Certain counties in Virginia prohibit Sunday sale of alcohol, mainly the south west counties. When in doubt, check with local county police department or simply ask store owner. Hard Liquor is only allowed to be sold by Virginia ABC (Alcoholic Beverage Control) stores. More information about these stores and other alcohol related information can be found at their website. Cheerwine, a regional cherry flavored soda, can be purchased in convenience stores in the more southern parts of the state. Virginia is home to over 130 wineries, spanning from the Eastern Shore to the Heart of Appalachia. Wherever you are in Virginia, there's a winery nearby. Virginia’s many wine trails across the state make visiting wineries easy and fun! Wine events statewide offer wine tasting, food, music, art, shopping and activities, such as grape stomping and hot air balloon rides. We have a comprehensive list of accommodation in Virginia searchable right here on Travellerspoint. You can use our map to quickly compare budget, mid-range or top of the range accommodation in Virginia and areas nearby. This is version 19. Last edited at 7:58 on Dec 23, 16 by Utrecht. 30 articles link to this page.